To redesign the website to better reflect NI Group (previously News International) as a market-leader in its industry; delivering the news to its customers in multiple ways, whilst also focusing on the world-class journalism that is an attribute to NI Group's success. Haime and Butler delivered a creative solution that matched our brief perfectly. They also provided outstanding project management support throughout and we are delighted with the finished product. We designed and built a website that offers a higher level of interaction with the user. 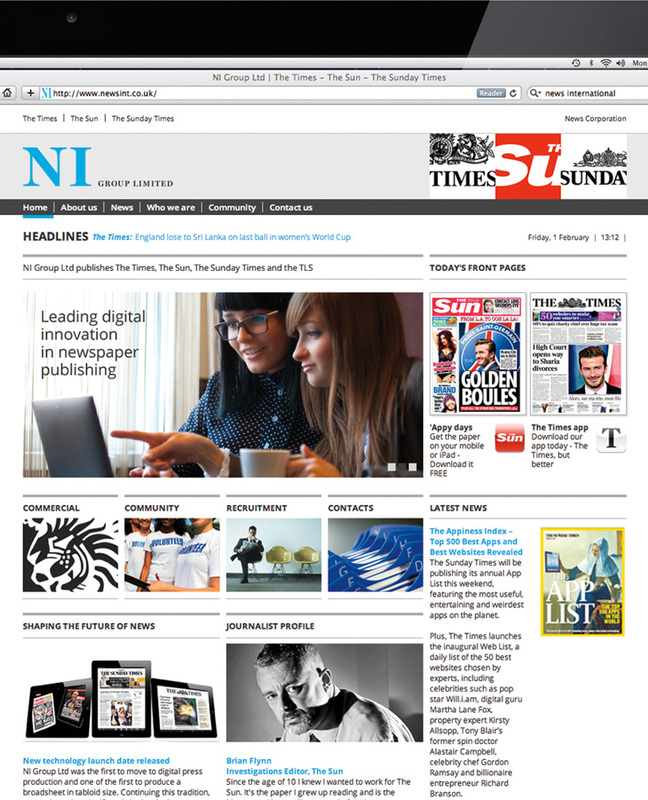 The site promotes the titles (The Sun, The Times and The Sunday Times) and the technology available that enables NI to deliver the news to their customers how, and when, they want it. Alongside this, we also designed an intuitive intranet for employees that ensures both external and internal channels are aligned in NI's offering and ethos. A fresh new look that is completely user friendly and engaging, with live news feeds and current news stories from each of NI’s titles. The homepage offers current content upfront, including live feed headlines direct from the titles, and the daily front pages. We introduced a journalist profile and current news stories from the Group, areas for each of the titles to promote their key features and promotions and links to download the titles' apps. 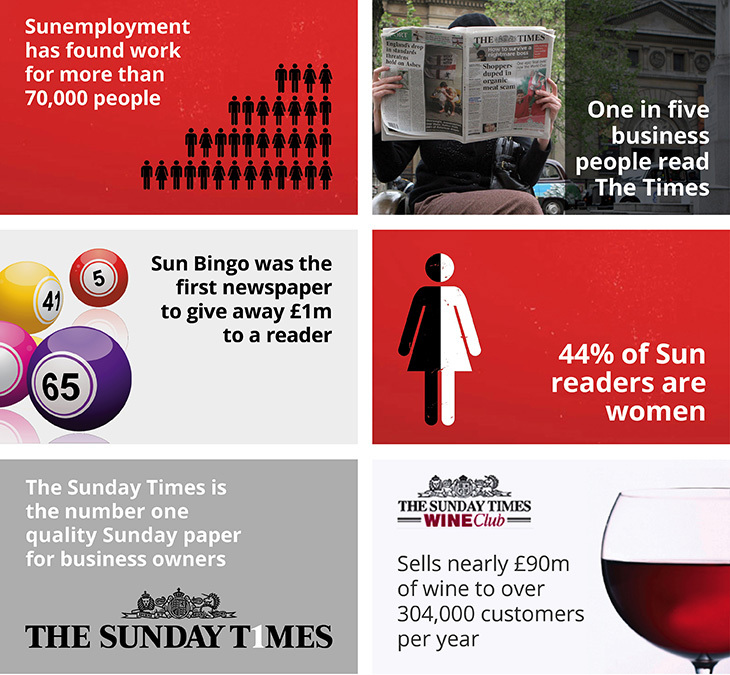 Parts of the site are dedicated to each newspaper title where key facts and figures are communicated in simple, bold info graphic panels. Being at the forefront of delivering news through the latest technology not only applies to their customers, but also their employees. The new intranet identity communicates how the site is individual to each and every user. 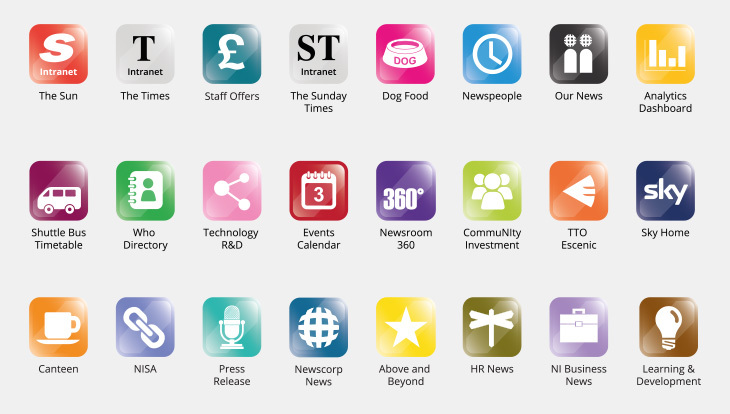 App icons are available for all intranet features which the user can store in their personal profile, so one simple click takes them directly to the info they need.